Our Hurricane snow day was so fun I thought it deserved a second post, dedicated entirely to the food the kids and I made. First up is the homemade, from-scratch hot chocolate that apparently everyone I know, except me, knows how to make. And I can officially tell you now that hot cocoa packets are crap. This homemade stuff – so rich and creamy and warm and chocolatey and comforting- it’s everything that’s good and fine in the world. Here’s the recipe, from Hershey’s Kitchens. Follow it exactly, including the salt and vanilla, for heaven in a cup. Pour all ingredients into a small saucepan and stir over medium heat. The cocoa and sugar will dissolve with stirring, I promise. Take care to watch the pot and keep it from boiling. You just need it warm enough to drink. We also made muffins on our snow day. 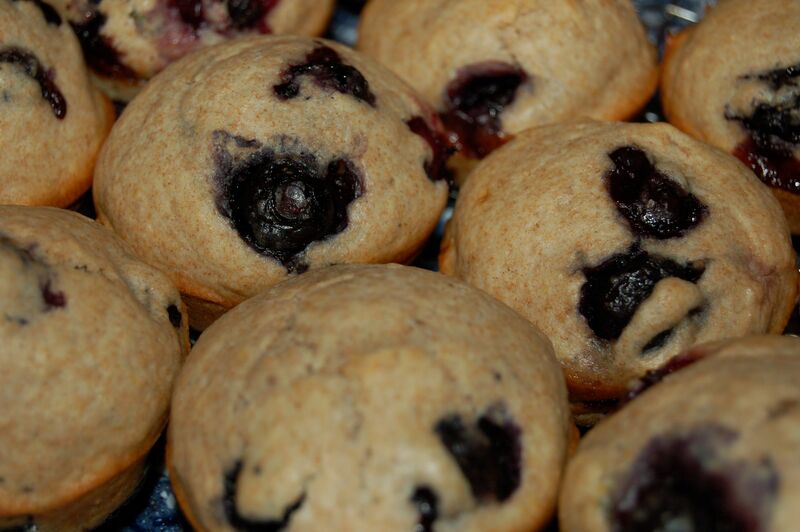 Since our daughter likes banana chocolate chip and our son likes blueberry, we made two separate batches. Now you see why we need Gobble Cakes nearby – our kids don’t like the same muffins, and they don’t like the same cupcakes either. Both of these muffin recipes are better with melted butter instead of oil, but I used up all my butter the night before to make Paula Deen’s cornbread. Preheat oven to 400 degrees F. Grease 12 muffin tins and set aside. In a large bowl, smash bananas and then add your wet ingredients – milk, oil, and egg – and mix them all together. 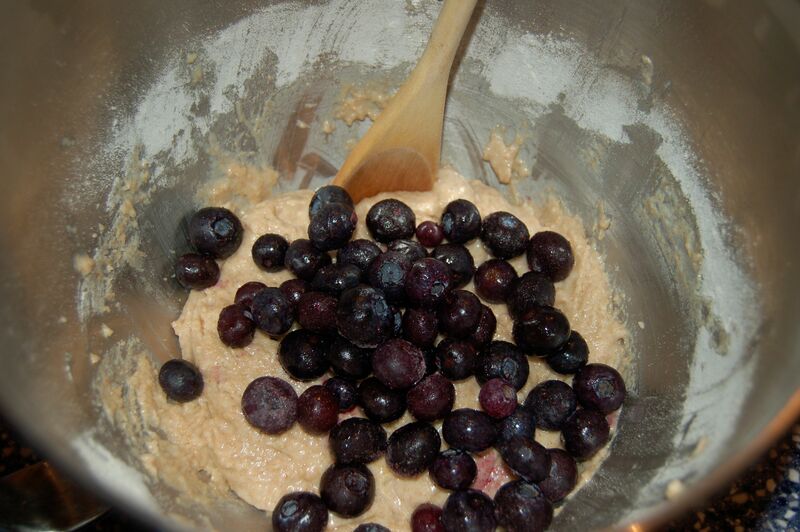 In a small bowl combine flour, sugar, baking powder, and salt. Pour dry ingredients into wet ingredients (I know this is backwards, but I smash the bananas in a large bowl, so this the way we do it) and stir until the dry ingredients are moistened. Batter will be lumpy. 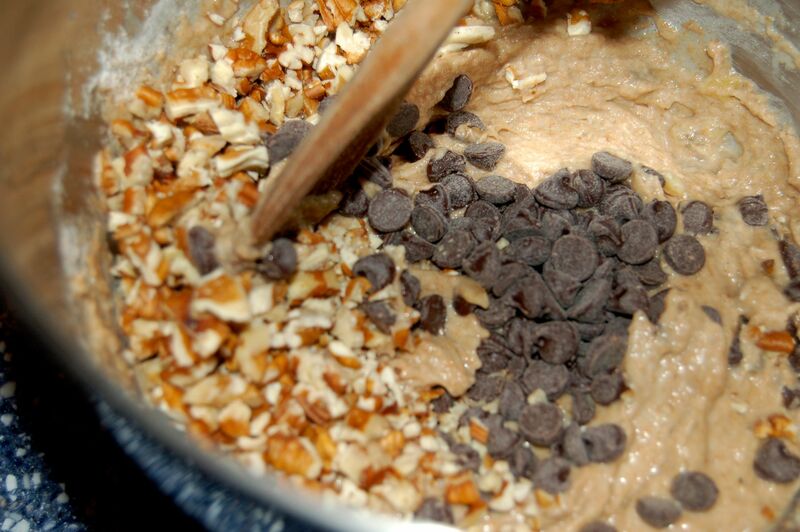 Gently fold in chopped nuts and chocolate chips. Spoon batter into greased muffin cups (we use an ice cream scoop for ease), filling each 1/2 to 2/3 full. Bake 18 to 22 minutes until golden brown and a toothpick inserted in the center of the center cupcake comes out clean (crumbs are okay, but not gooey batter). Cool in muffin cups for 5 minutes, then remove and serve warm.